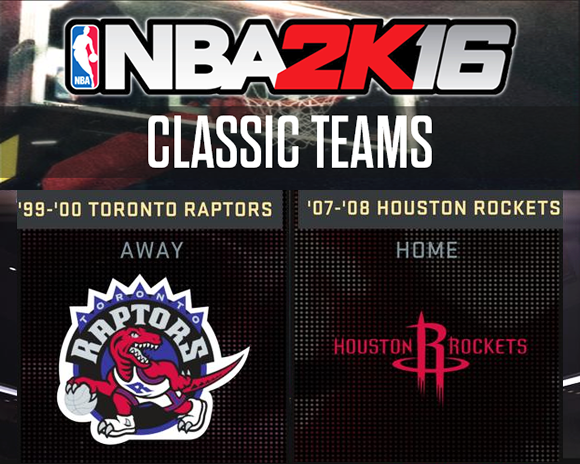 NBA 2K16 is adding to its already rich feature set by including 12 new classic teams in the game. Today, 2K Sports has announced that they will be adding the '07-'08 Houston Rockets and '99-'00 Toronto Raptors to the list. Six teams have now been confirmed. The 2008 Rockets led by Tracy McGrady had an impressive 22-game winning streak despite losing Yao Ming in the playoffs. As for the classic Toronto squad, it featured some of the best talent a Raptors team has ever had. It was the final year of T-Mac in Toronto and Vince Carter's breakout season. 2K will reveal two new classic teams every Thursday, so stay tuned.